As I’ve written before, we are convinced that the web and its various components must be the focus of any small business’ marketing strategy. Again, the Internet should not be your only marketing tactic, but it is the vital core that you fail to maximize at your own peril. What I find interesting and honestly a little irritating, are the prospects who contact me with the request that I help them with SEO without even contemplating building their online marketing presence. Talk about putting the cart before the horse. A comprehensive online marketing presence will, all by itself, deliver most of the Search Engine Optimization you will ever need. Frankly, that is most certainly Google’s objective. Most of the Google algorithmic changes we hear about are intended to make that true. Google is searching for your total web presence in order to determine where they should place your site in their search results. Many of us are familiar with the concept of the marketing funnel. You hunt for as many leads as you can find and shovel them into the large opening in the funnel. Hopefully there will be enough of them so that some can actually be forced through the small hole and become customers. Then, you simply shovel more leads into the top. I happen to believe the real payoff in marketing comes from expanding and focusing your thinking on how to turn a lead into not only a customer, but into an advocate for your business. My problem with the funnel is that it only focuses on the chase. 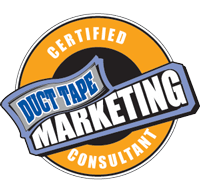 To address this, Duct Tape Marketing developed the concept of The Marketing Hourglasssm. The top half indeed resembles the funnel concept, but the expanding bottom half adds the necessary concentration on the total customer experience. The experience that ultimately leads to referrals and marketing momentum. I know you are probably sick and tired of hearing how “Content is King”. Unfortunately, in today’s competitive information world, it is. People expect to find information about any product, service, company, individual, or challenge they face, by turning to Google. If they are not finding content that you have produced providing them that information, even if someone referred them to you, there’s a pretty good chance you won’t be worthy of their trust. Real success today requires you to commit to content production and make it an important element of your overall strategy. This content should do two things – educate and build trust. These two categories of your content strategy must be delivered through the creation of very specific forms of content and not simply through sheer volume. Every business is now a publishing business, so you’ve got to start to think like one.